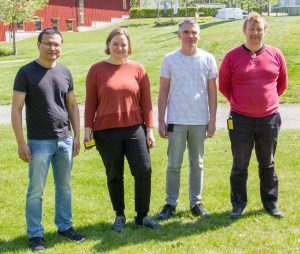 International conference devoted to quantum theory, experiment and technology at Linnaeus University in Växjö, June 12-15, 2017. This is the 18th Växjö conference devoted to quantum foundations and applications of quantum theory, especially quantum information. It is devoted to quantum foundations (including philosophical issues), experiment, and recently developed quantum technologies (with emphasize of their foundational aspects). This year there will be a special session on Quantum-like access to big data, organizers: A. Khrennikov and M. Melucci on Thursday June 15th between 9.00-10.30. First publication within DISA is now available! Thomas Holgersson, professor in statistics and a part of DISA, he had the first publication affiliated with DISA accepted.The article Towards a Multivariate Innovation Index has be published in Economics of Innovation and New Technology 2017. Abstract: This paper argues that traditional measures of innovation as a univariate phenomenon may not be dynamic enough to adequately describe the complex nature of innovation. Consequently, the purpose is to develop a multidimensional index of innovation that is able to reflect innovation enablers and outputs. The index may then be used (i) to assess and quantify temporal changes of innovation, (ii) to describe regional differences and similarities of innovation, and (iii) serve as exogenous variables to analyze the importance of innovation for other economic phenomena. Our index is defined in a four-dimensional space of orthogonal axes. An empirical case study is used for demonstration of the index, where 44 variables are collected for all municipalities in Sweden. The index spanning the four-dimensional innovation comprises size, accessibility, firm performance, and agglomeration. The proposed index offers a new way of defining and analyzing innovation and should have a wide range of important applications in a world where innovation is receiving a great deal of recognition. Posted in General | Comments Off on First publication within DISA is now available! The design of the detection tanks and of the full array. The construction of a prototype detection unit on the Växjö campus, including choice of the photo-multipliers, of the scintillator and Cherenkov units optimization, and of the electronics needed to digitize the photo-multiplier signals. The optimization of the array trigger. The preparation of storage, transport and online and offline analyses of the “Big Data” generated by the experiment which will take data 24h per day with no interruptions. During the period May- September 2017 the group has an invited Guest Professor from University of Marseille, Jean-Pierre Ernenwein. For more information on ALTO see the university website or the project website. If you have any questions about the project, please contact the project leader Yvonne Becherini.